Sting in the tail. Meet ‘Bumblebee’: Fhiona Scott’s Imola Yellow S3 that might look largely standard, but that’s ready to deliver a substantial turbocharged attack when provoked… Words Jordan Ballard. Photography Adam Walker. It’s probably safe to assume the vast majority of car nuts reading this fine publication have held this deeprooted passion for all things four wheels as long as they can physically remember, meaning it’s always particularly interesting to hear from an individual whose interests were instead piqued later on in life. Scotland-based Fhiona here is one such person. 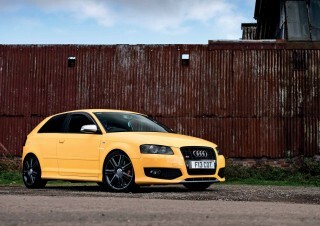 Now the proud owner of this brightly-coloured S3 that boasts a list of modifications that might lead you to assume she’s been immersed in the Audi scene for several years, it’ll probably surprise you to learn that before she snapped up this particular car a couple of years back, she actually had close to zero interest in motors altogether. With encouragement from her car-mad husband that a hot hatch might just be the perfect way to add a little more excitement into her car life, it didn’t take long for Fhiona to finally be united with what quickly became christened ‘Bumblebee’. The car’s initial role was to be a reliable daily driver, safely shuttling its new owner to and from her late mother’s house to help with caring duties. 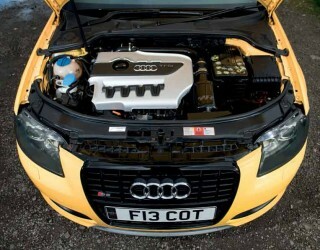 It’s unsurprising that, for the first year or so at least, the S3 remained in nigh-on standard trim, then. From here on out, Fhiona fell down the slippery slope we’ve all come across when it comes to modifications, carefully picking and choosing only the very finest upgrades to address what she believed to be weak points in the car’s performance (as well as performing religious maintenance work too, it goes without saying). Next up, then, was a SACHS clutch and flywheel package to bolster the car’s manual ‘box after the factory clutch started slipping when trying to handle the extra power on tap. “The engine management light came on a few days later, too, which turned out to be a fuel injector, so all four of those were replaced,” Fhiona says, adding that this was around the same time the car’s big mid-life service also occurred to ensure optimum longevity of her prized asset. Next up came another family present – this time a Racingline intake from Fhiona’s husband. “I love the noise of the induction now, not too loud, but the whirling sounds it produces always put a smile on my face!” Talking of adding a little more noise, some extensive chats with tuner Dave Henderson from DH Automotive (the man that’s taken care of the car since the very beginning and has offered guidance to Fhiona when it comes to upgrades almost every step of the way) soon lead to a Scorpion turbo-back exhaust system also finding its way into the mix – perfectly nailing the strict brief of supplying only a slightly more aggressive noise but significant performance hikes. With some Bilstein coilovers fitted and set up to fast-road perfection, Bumblebee’s next visit to DH Automotive was to fix a failed Quattro controller and pump, with Fhiona taking this opportunity to ask Dave to add a Stage 2 map onto the car’s ECU to tie together all of its new hardware goodies – yielding overall results of 355bhp and 379lb ft of torque – not too shabby at all, we think you’ll agree! Since then, some final tweaks such as an uprated fuel pump, larger front brakes from a TTS and finally a Stage 2+ map from MRC Tuning have completed the ‘rapid all-rounder’ package perfectly. “The boost feels even stronger now, I love it and can’t wait for my next run down the quarter mile strip,” a clearly delighted Fhiona reveals. Top: MRC Tuning Stage 2+ ECU re-map was fitted by DH Automotive. Right: Scorpion turbo-back exhaust system. She might’ve been keen to largely retain her car’s factory looks throughout to add to the sleeper vibe, but Fhiona has added some alterations to her S3’s aesthetics to help it fully live up to its ‘Bumblebee’ nickname. Dotted with bee stickers over its Imola Yellow body, she’s also applied some eye-catching airbrushing art to the battery cover under the engine bay to finish the job off. But with 360bhp available to all four wheels, it’s best not to take this machine too lightly!